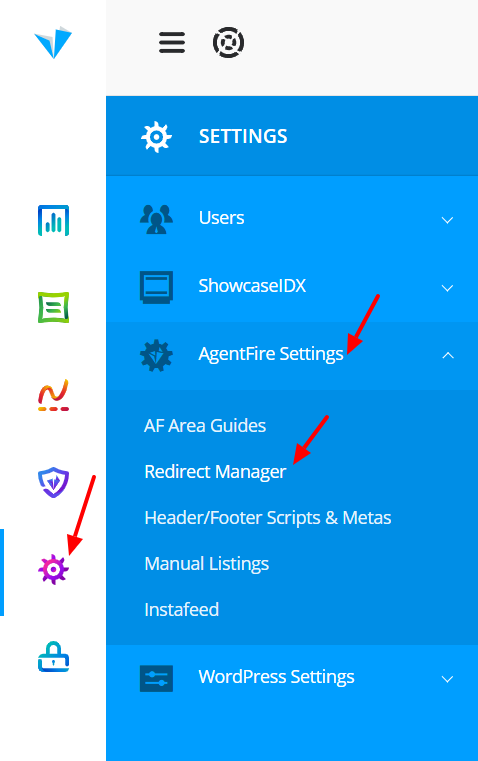 To do 301 redirects, simply navigate to Settings> Agentfire Settings> Redirect Manager on your admin dashboard. As the new window opens you will be able to see the redirects that have been setup so far, and as well the ability to add a new one. To add a new one, click on the "Add Row" button. As you have the new row added for the redirect you want to set up, place the old URL (link) on the left side of the row and the new link to the right side. As you do that, click on the Update button to save the changes. 1. If you are already on our AgentFire platform and change the domain name, you do not need to add redirects. 2. If you are on another platform and switch to our AgentFire platform, you need to add the 301 redirects and do a Google Change of Address. My Domain Name is Changing - How can I preserve ranking? 3. If you change the permalink structure you will also need 301 redirects.